Four years after the Great Recession officially ended, the nation's unemployment rate remains above 7 percent. Twelve million Americans are unemployed. Ten million more are classified as "underemployed." 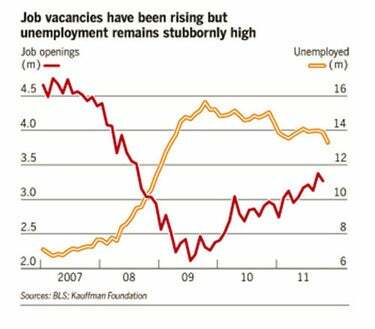 The bad news for the unemployed gets worse. The U.S. Department of Labor Statistics reports the number of "open" jobs -- positions that employers advertise but have not found "qualified" applicants for -- has doubled from 1,900,000 jobs in June 2009 to 3,900,000 vacant positions in June 2013. That shouldn't happen, according to a well-established economic theory known as the Beveridge Curve, named after 20th century English economist William Beveridge. 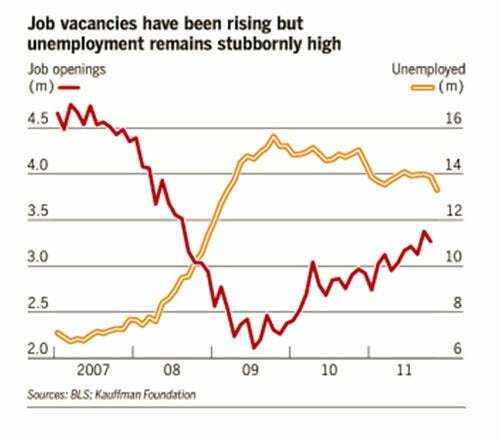 The Beveridge Curve has documented since 1958 that as unemployment rates rise the number of open job postings drop because employers are either reticent to hire and add to payroll in uncertain economic times or see no reason to advertise for "open" jobs because job-seeking applicants flood their human resource department's electronic inboxes. As disheartened job applicants, frustrated employers and bewildered economists try to understand this structural employment imbalance, the media has given it a name. They call it a "skills gap." "A significant gap between an organization's skills needs and the current capabilities of its workforce that occurs at the point at which an organization can no longer grow or remain competitive because they don't have the right skills to drive business results and support the firm's strategies and goals." Though a bit lengthy, the ASTD definition appears reasonable and straightforward. After all, if a company can't attract, or retain, the people it needs to grow or execute its strategic goals, it falls into a skills gap and withers away to irrelevancy. There is, however, a fly in the "skills gap" ointment: Stubborn economists and academics who laugh at the mere mention of a "skills gap." For them, if a skills gap existed, there must also be a corresponding spike in wages earned, or the length of the average work week must increase. Their review of reams of macroeconomic data reveals no broad consensus in those areas. Hence, a "skills gap" does not exist. But it sure does in the IT market. A recent study funded by Microsoft reports there are 120,000 new jobs created in the United States each year that require the skills of workers with degrees in computer science. The U.S. education system, however, produces only 49,000 such degrees annually creating a gap of 71,000 available jobs. Those jobs that remain "open" without qualified candidates. This creates a "skills gap" that some companies want to fill with foreign workers via the highly controversial H-1B visa. The existence of an IT skills gap is further substantiated by PayScale, a global compensation firm based in Seattle, which reports salaries for information technology jobs are rising 5.1 percent per year. A rate that is 45 percent higher than an average job in America. How do economists explain the employment enigma of a skills gap? They point to several scapegoats. First, they blame overly selective employment practices of firms. Peter Capelli, a professor of management at the University of Pennsylvania's Wharton School, says "employers, with an abundance of workers to chose from, are demanding more of job candidates than ever before. They want prospective workers to be able to fill a role right away without any training. To get a job, you have to have a job already. It's a Catch-22 situation for workers." Determine operational objectives by studying business functions; gathering information; evaluating output requirements and formats. Design new business systems by analyzing requirements; constructing workflow charts and diagrams; studying system capabilities; and writing specifications. Collaborate with CTO to ensure that all new solutions and systems modifications meet technical, security, and performance requirements and be a good fit with systems architecture. Define project requirements by identifying project milestones, phases, and elements; forming project team; and establishing a project budget. Lead the implementation of business systems solutions and new processes in collaboration with business and technical sponsors. Monitor project progress by tracking activity; resolving problems; publishing progress reports; and recommending actions. Conduct functional and systems tests to ensure systems work as intended. Create and deliver user documentation; training, and support for business systems. Develop and implement new work flows as needed. Act as liaison between IT and all business functions. Identify potential new vendors to fulfill requirements. Advise COO on options, risks, and costs associated with different software. Provide assistance to Department Managers to resolve operational issues. A Bachelor's degree in Finance or Information Systems. An Advanced Degree is not required, but is preferred .Candidate must be highly skilled at functional systems analysis and requirements documentation; meeting facilitation, project management, functional test planning and execution, SQL Query development, data analysis, and system troubleshooting.Candidates must have significant experience with at least one report design / development platform (preferably SQL Server Reporting Services).Considerable knowledge of business process management; the ability to initiate process change and the ability to work well independently and collaboratively is required. Proficiency with configuring and maintaining SharePoint sites and customizing Microsoft CRM are required." Commenting in Computerworld about these lengthy job descriptions, a job-seeking IT executive said, "employers are advertising for purple squirrels and pink unicorns, they want the perfect job candidate and that person just doesn't exist." Dr.Capelli also blames the skills gap "open" job syndrome on employers that are stingy and "can't get candidates to accept jobs at the wages offered." That, he says, "is an affordability problem, not a skills shortage." The Federal Reserve Bank of Atlanta, however, refutes Capelli's "affordability" argument in a recent report that claims less than one in 10 jobs remain "open" because of the salary card. But why should IT professionals, who work in an industry that has an unemployment rate of 3.14 percent even care about the "skills gap"? Isn't the "skills gap" something liberal arts majors should worry about? CompTIA, a technology association focused on professional development, reports in a recent study that "93 percent of employers indicate there is an overall skills gap among their IT staff." That's an amazing number. But not entirely surprising. Log on to Google or Bing and type "technology skills gap" in the search box. You can expect roughly 22,300,000 returns. Where Are Biggest Gaps in IT SKills? So just where are the "skills gaps" in the tech field. According to the CompTIA study, the specific tech jobs where skills go wanting are "security/cybersecurity, network infrastructure, big data, server/data center management and data analytics/business intelligence." And finding qualified candidates with these skills is getting increasingly difficult. One Web startup in Boston recently offered its staff a $30,000 referral bonus for finding an "awesome" software developer. How current are your technology skills? I often ask that question to IT professionals. Most answer by saying,"I am too busy doing work that needs to be done to hone my skills in those areas." That is a very shortsighted strategy. Closing your tech skills gap may not be enough. The Institute of the Future, a respected California-based think tank, collaborated with the University of Phoenix, the online university, to produce a report entitled "The Future of Work 2020" that claims skills like "novel and adaptive thinking, the ability to virtually collaborate, proficiency in new media literacy, cross cultural communication and cognitive load management" are the most essential skills to possess. How proficient are you in those areas? And here's another reason why information technology professionals need to continue to hone their skill set: the service industry tipping point in the Peoples Republic of China. According to Wind Info, a Chinese financial services research firm, by the end of 2013 the percentage of Chinese workers who are employed in "services" jobs will surpass the number of workers in manufacturing jobs in China. In a globally connected "flat" world that is a concern for all IT workers. So, is the "skills gap" fact or fiction? For me, it is overwhelmingly a fact -- particularly so in the information industry. But perhaps the term "skills" gap is a misnomer. Adam Davidson, an award-winning economic columnist for The New York Times, wrote an article in November 2012 about the skills gap in the manufacturing industry. In summing up his piece Davidson wrote that "the skills gap isn't a narrow problem facing the manufacturing industry. The so-called skills gap is really a gap in education, and that affects all of us." More on the "education" gap in the next segment. Gary Beach is Publisher Emeritus for CIO.com and CIO Magazine. Follow him on Twitter @GBeachCIO. Follow everything from CIO.com on Twitter @CIOonline, Facebook, Google + and LinkedIn. Gary Beach is the publisher emeritus of CIO magazine.